Fill the chocolate dipped mini cups with ice cream, espresso, or a little liqueur. Every once in a while, some brilliant foodie invents the exact delectable treat we didn't know we needed. 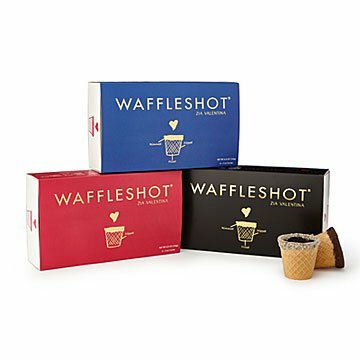 Cue: waffle shots. It's like an ice cream cone and a candy bar had a baby. Fill the six dipped mini cups with ice cream, espresso, or—if the mood is right—a little liqueur. Whatever you choose, we recommend topping it off with a dollop of whipped cream (and maybe a sprinkle or two?). A playful addition to girls' night in, or just a sweet way to polish off dinner, it makes a great gift for hostess friends or sweet-toothed loved ones. Made in California. My girlfriend will love this gift. It's cute, and tastey. My bestie has everything so she's hard to buy for. She loves sweets and booze but getting her something from the grocery store was getting old. This is adorable, tastey and can be used so win so ! Didn't think a cone could enhance the ice cream but it's true. Seriously the best thing created since ice cream itself.